Title card for Police Squad! The subtitle "in color" was a deliberate anachronism; network television shows in the United States had transitioned from black-and-white to color by the late 1960s. Police Squad! is an American television comedy series broadcast on the ABC network in 1982. It was created by David Zucker, Jim Abrahams, and Jerry Zucker, and starred Leslie Nielsen as Frank Drebin. A spoof of police procedurals, the series featured Zucker, Abrahams and Zucker's usual sight gags, wordplay and non sequiturs. While a parody of many television shows and movies, it bore a particular resemblance to the Lee Marvin cop show, M Squad (especially the opening credits) and the late 1960s series Felony Squad. Although cancelled after six episodes, the show spawned The Naked Gun film series. In 2013, TV Guide ranked it #7 on their list of 60 shows that were "Cancelled Too Soon". Police Squad! was created by Zucker, Abrahams and Zucker, who had all previously worked together on The Kentucky Fried Movie and Airplane!. Despite critical acclaim, the show was cancelled by ABC after just six episodes. The show gained a strong cult following through repeat broadcasts, which led to The Naked Gun film series. Many of the gags on the show were recycled to all three films. Alan North played the role of Captain Ed Hocken on the show; in the films, the role was played by George Kennedy. Peter Lupus co-starred as Officer Norberg, but in the films, O.J. Simpson appeared as the similarly named Officer Nordberg. Apart from Nielsen, the only actors to reprise their role in the films were Ed Williams, who played scientist Ted Olson, and Ronald "Tiny Ron" Taylor as Al, a very tall officer who is seen only from the neck down. Robert Goulet, who appeared as one of the "special guest stars" who were invariably killed off at the beginning of their episodes, appeared as the villain, Quentin Hapsburg, in the second Naked Gun film. Joyce Brothers played herself in the first Naked Gun film. She also played herself in the fourth episode of the show. Each episode featured end credits over a 1970s style freeze frame of the final scene, except that the frame was not frozen – the actors simply stood motionless in position while other activities (pouring coffee, a convict escaping, a chimpanzee throwing paper) continued around them. Each episode had two different titles. The first title was shown on the screen, while announcer Hank Simms (famous for his announcing style on Quinn Martin Detective shows), reads the second one instead. The episodes were written to be shown in a specific order, which was indicated on-screen in two ways. Firstly, the episode number often corresponds to the number of garbage cans that Frank's car crashes into when it arrives at the crime scene. Secondly, during each episode's epilogue sequence, either Drebin or Hocken states that the guilty party brought to justice is being sent to Stateville Prison – and lists all the characters sent there from previous episodes, in reverse order, where applicable. Sally Decker (Kathryn Leigh Scott), a teller at a credit union, murders her boss so she can steal money from the credit union and pay her orthodontist the money she owed. She kills a customer and frames him for the murder. The Police Squad department is called in to investigate the case; Frank is suspicious about the customer's guilt. In order to expose corrupt boxing manager Mr. Martin (Rudy Solari), Frank goes undercover as manager Bob Kelly. Frank makes a deal with boxer Buddy Briggs, whom he trains for a title fight against the current champion "The Champ" (Grand L. Bush). However, Martin has kidnapped Briggs' wife, and will only release her if Briggs deliberately loses the fight. In a race against the clock, Frank has to find Buddy's wife before Buddy gets knocked out. Frank, Ed, and Norberg investigate the kidnapping of Terri Burton (Lilibet Stern), the daughter of a wealthy businessman, who has been kidnapped during her 18th birthday party. The kidnappers demand $1,000,000 ransom money. The only witness to the kidnapping is Burton's boyfriend Kingsley Addison (Ken Michelman), who had plans to marry Burton. The Police Squad department is sent to investigate a bombing at the courthouse. The main suspect is Eddie Casales (Spencer Milligan), a bomber who was sent to jail by the victims killed in the explosion. Following the attack on the courthouse, the assistant DA who prosecuted Casales is killed with a bomb hidden in his car. All evidence points to Casales, but Frank thinks it is a setup. After a small group of mobsters blackmail various store-owners, Frank and Norberg go undercover and set up a key-making and locksmith store. The mobsters offer Frank "protection" in exchange for money, but Frank declines. While they attack the store with guns, Frank and Norberg's Locksmith store remains, enraging the mobsters' boss. Frank investigates a body of a struggling comedian found at the bottom of a cliff in a car crash. Although the comedian's death appears to be a suicide, Frank soon learns that this comedian was an informant on a drug ring he infiltrated at his nightclub. In order to catch the person responsible, Frank takes the place of the deceased at the nightclub he worked. Drebin, Norberg and Hocken, the main characters of Police Squad! Leslie Nielsen portrayed Sergeant Frank Drebin, Detective Lieutenant Police Squad. Jerry Zucker explained that the name Drebin was picked blindly from the phone book. Zucker, Abrahams and Zucker had met Nielsen when working on Airplane! (1980) and felt their kind of humor matched. The team felt Nielsen would be perfect as Drebin as the character lampooned the roles Nielsen had played in television dramas such as The Bold Ones: The Protectors and S.W.A.T.. Ed Williams co-starred as lab technician Ted Olson; Williams had been a science teacher for many years and had done a little acting. Zucker, Abrahams and Zucker were amazed by his performance. Rex Hamilton was credited in every episode as "Abraham Lincoln", and the same clip of him was invariably played in the opening credits. However, he never appeared in the program, only in the credits. Of the main cast, Nielsen, Taylor, and Wiliams were the only ones who returned and portrayed their original characters in The Naked Gun film series. Captain Ed Hocken was portrayed by George Kennedy in the film series, while O. J. Simpson played Officer Nordberg (slightly renamed from 'Norberg'). 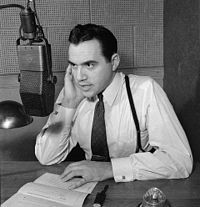 Lorne Greene was a special guest star in the first episode. 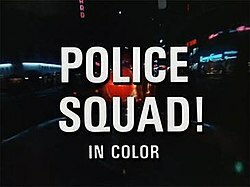 The show's opening sequence was a satire on traditional opening sequences of crime dramas at that time, and of the 1960s, particularly M Squad and various Quinn Martin shows such as The Fugitive and particularly The New Breed (which also starred Nielsen). Hank Simms, who had worked as an announcer for some of Quinn Martin's programs, announced the title of each episode, though the spoken title never matched the title caption. The sequence introduces Nielsen and North as their characters during a shoot out, as well as Abraham Lincoln impersonator Rex Hamilton, who dramatically returns gunfire to John Wilkes Booth. Hamilton never appeared in the show itself. Another recurring gag used in the opening sequence was the introduction of a "special guest star", a celebrity who was introduced but immediately murdered during the credits. Lorne Greene, Georg Stanford Brown, Robert Goulet, William Shatner, Florence Henderson and William Conrad appeared as special guest stars during the show's run. A scene with John Belushi, tied to blocks of concrete under water, was filmed but replaced with footage of Henderson, due to Belushi's subsequent death before the episode was broadcast. Belushi's death came as a shock to Zucker, Abrahams and Zucker, as they had joked about it after he almost choked during the filming of the scene. A list of possible celebrity death shots was included on the show's DVD release in 2006. The show was set to mock cop procedurals the same way Airplane! mocked disaster movies. Zucker, Abrahams and Zucker wrote the pilot episode, in which most straight lines were directly copied from an M Squad episode. In fact, the pilot episode was an almost scene-for-scene remake of "More Deadly," the opening episode of the second season of M Squad. Pat Proft, who had worked with Zucker, Abrahams and Zucker on Airplane! and The Kentucky Fried Movie, wrote the third episode. Robert Wuhl was invited to join the writing staff after he had auditioned for the lead role in Airplane!. He co-wrote the show's second and sixth episodes with Tino Insana. Both episodes contained cultural references to old movies such as On the Waterfront and The French Connection. In the audio commentary Wuhl recorded for the DVD release, he mentioned that it was a nice opportunity, but that he did not really feel a connection with the show, especially because of its short run. The famous theme, composed by Ira Newborn. The opening and closing music was penned by composer Ira Newborn. The jumping big band theme (a parody of the M Squad theme composed and performed by Count Basie) was retained for the Naked Gun movies, along with the opening police-light visual of the Police Squad! series. ABC announced the cancellation of Police Squad! after four of its six episodes had aired in March 1982. The final two episodes were aired that summer. According to the DVD Commentary of "A Substantial Gift" (episode 1), then-ABC entertainment president Tony Thomopoulos said Police Squad! was cancelled because "the viewer had to watch it in order to appreciate it." What Thomopoulos meant was that the viewer had to pay very close attention to the show in order to get much of the humor, while most other TV shows did not demand as much effort from the viewer. In its annual "Cheers and Jeers" issue, TV Guide magazine called the explanation for the cancellation "the most stupid reason a network ever gave for ending a series." Matt Groening, creator of The Simpsons, has said, "If Police Squad! had been made twenty years later, it would have been a smash. It was before its time. In 1982 your average viewer was unable to cope with its pace, its quick-fire jokes. But these days they'd have no problems keeping up, I think we've proved that." In 1985, Paramount Home Video first released all six episodes of the show on VHS, Betamax, and LaserDisc; Paramount released the show on two separate volumes: Police Squad! : Help Wanted! and More! Police Squad!, each volume containing three episodes. On the release of the show, Washington Post critic Tom Shales commented "People can rent them and laugh, and then cry that ABC was so cruel." Paramount and CBS DVD first released the series on DVD in 2006 in a keepcase, on one disc. The DVD contained various extras, including actual production notes from network executives, a "freeze-frame" that was filmed but never used, bloopers, casting tests, and an interview with Nielsen. Zucker, Abrahams and Zucker, producer Robert K. Weiss and writer Robert Wuhl recorded audio commentary for the first, third and sixth episodes. Critics universally praised how the show was still funny more than 20 years after its cancellation. The DVD set was nominated for a Satellite Award for Best DVD Release of a TV Show, though it lost to the DVD set of the eighth season of Fox's The Simpsons. While the Police Squad VHS and Beta videocassette releases had audio only playable in mono sound, the 2006 CBS/Paramount DVD release had its audio remastered and all 6 episodes are available in Dolby Digital 5.1. Six years after the cancellation of Police Squad!, the first Naked Gun film was released called The Naked Gun: From the Files of Police Squad!. It performed well at the box office grossing around $78,756,177. The hit comedy became so popular that two sequels The Naked Gun 2½: The Smell of Fear (1991) and Naked Gun 33⅓: The Final Insult (1994) were released. The Naked Gun 2½: The Smell of Fear was considered the most successful of the three, grossing around $86,930,411, while Naked Gun 33⅓: The Final Insult grossed $51,132,598. Roger Ebert rated the first movie 3½ out of four stars, and gave 3 stars to the two following films. Some of the jokes that were used in the commercials were originally taken from Police Squad! such as when Ed says "Cover me!" and gets covered with a blanket, which was a gag taken from "The Butler Did It (A Bird in the Hand)". The advertisements were shown in British cinemas as well as on television. They were directed by John Lloyd, with such apparent success that Zucker, Abrahams and Zucker approached him to direct Naked Gun 33⅓: The Final Insult, but he turned them down. After the show's cancellation (and well before production on the Naked Gun movies), the producers considered turning the show into a movie by linking several episodes together with new scenes. A few of these scenes were actually filmed (including an elaborate "freeze frame" gag involving a burning courtroom) before the project was abandoned. This footage can be viewed on the DVD release. The Police Squad! characters were resurrected during the WWE's Summerslam 1994 PPV. In this guise, they were looking for The Undertaker, who in storylines had previously vanished. Sledge Hammer!, a sustained satire of Dirty Harry and other action heroes. A Touch of Cloth, a 2012 UK mini-series that spoofs crime shows in similar fashion. Angie Tribeca, a 2016 TV series that also spoofs crime shows in a similar fashion. ^ a b "The TVIV". Police Squad!. Retrieved January 3, 2008. ^ The creators stated this in a featurette for The Naked Gun 2½: The Smell of Fear. ^ "Barnes and Noble". Police Squad! DVD Release. Retrieved January 19, 2008. ^ "Police Squad! at TV Guide". Premise. Retrieved January 3, 2008. ^ "Dr. Joyce Brothers at Tv.com". appearances. Retrieved January 3, 2008. ^ a b c d Zucker, Jerry; Abrahams, Jim; Zucker, David; Weiss, Robert K. Police Squad: The Complete Series: Audio Commentary for "A Substantial Gift (A Bird in the hand)" (DVD). CBS Paramount. ^ Werts, Diane (November 10, 2006). "Badge of Humor – Short-Lived 1982 Series that Spoofed Cop Shows Comes with some Great Extras". Lexington Herald-Leader. p. 11. ^ a b c d Zucker, Jerry; Abrahams, Jim; Zucker, David; Weiss, Robert K. Police Squad: The Complete Series: Audio Commentary for "The Butler Did It (A Bird in the Hand)" (DVD). CBS Paramount. ^ a b c d Wuhl, Robert. Police Squad: The Complete Series: Audio Commentary for "Testimony of Evil (Dead Man Don't Laugh)" (DVD). CBS Paramount. ^ McKerrew, Steve (July 24, 1991). "Quirky ' Police Squad !' returns". The Baltimore Sun. p. C10. ^ Abrotsky, Justin L. (November 29, 2010). "In Memory of Leslie Nielsen: The hilarious intro and ending to Police Squad!". Sun Sentinel. ^ Berhman, John (March 9, 1985). "Escondido teacher Rex Hamilton is dead at 60". The San Diego Union. p. II-1. ^ a b Bark, Ed (July 13, 1997). "Tired of TV? Try...UBN No hits, No hype. Just one critic's idea of the perfect prime-time week". The Dallas Morning News. p. 1C. ^ "Police Squad introduced clueless Frank Drebin −90210 makes debut on DVD". The Washington Times. November 9, 2006. p. C1. ^ Shales, Tom (July 1, 1982). "Okay, Hands Up! ' Police Squad ! ': Back And Copping Laughs". The Washington Post. p. M20. ^ a b Terrance, Vincent (1985). Encyclopedia of Television Series, Pilots and Specials: 1974–1984. VNR AG. p. 329. ISBN 978-0-918432-61-2. ^ Bark, Ed (December 29, 1985). "The Best of '85 (and a few duds, too!)". Dallas Morning News. p. 1C. ^ Police Squad: List of Celebrity Death Shots (DVD). CBS Paramount. ^ Carr, Jay (December 12, 1988). "Exposing a trio of film makers who take spoofs quite seriously". Boston Globe. p. 5C. ^ Baenen, Jeff (November 27, 2003). "Screenwriter just loves laughs". Deseret News. p. C4. ^ a b Reinhart, Mark S. (2009). Abraham Lincoln on screen: fictional and documentary portrayals on film and television. MacFarland. p. 176. ISBN 978-0-7864-3536-4. ^ Westbrook, Bruce (November 7, 2006). "Police Squad has arresting humor – Cult TV series only had six episodes". Houston Chronicle. ^ "Police Squad! at the Internet Movie Database". Awards. Retrieved January 3, 2008. ^ "4 TV Shows That Should Have Lasted Longer". CBS Interactive. Archived from the original on 8 October 2010. ^ Burr, Ty (December 20, 1991). "Trigger-Happy". Entertainment Weekly. Retrieved November 15, 2009. ^ Bark, Ed (December 29, 1985). "The Best of '85 (and a few duds, too !) – Videos:". The Dallas Morning News. p. 1C. ^ Shales, Tom (July 24, 1985). "TV Could Take Lessons from Coke Executives". The Washington Post. p. 16. ^ Hicks, Chris (December 29, 2006). "The best of 2006: DVDs". Deseret News. p. W1. ^ Russo, Tom (December 31, 2006). "Extras – from commentaries to featurettes to complete alternative versions – make these discs extraordinary". The Boston Globe. p. 20N. ^ Westbrook, Bruce (November 7, 2006). "New on DVD: Police Squad has arresting humor – Cult TV series only had six episodes". Houston Chronicle. p. 2. ^ Owen, Rob (November 19, 2006). "Popular Discs – TV Shows on DVD are Gifts with Something Extra". Pittsburgh Post-Gazette. p. GG8. ^ Barnhart, Aaron (December 6, 2006). "Police Squad: Big laughs from a little DVD set". Kansas City Star. ^ "2006 11th Annual Satellite Awards". International Press Academy. Archived from the original on September 17, 2011. Retrieved November 15, 2009. ^ "BoxofficeMojo". The Naked Gun: From the Files of Police Squad!. Retrieved January 11, 2008. ^ "BoxofficeMojo". The Naked Gun 2½: The Smell of Fear. Retrieved January 11, 2008. ^ "BoxofficeMojo". The Naked Gun 33⅓: The Final Insult. Retrieved January 11, 2008. ^ "RogerEbert.com". The Naked Gun movies. Retrieved Sep 22, 2009. ^ "Red Rock Cider commercials on Youtube". Retrieved January 11, 2008. ^ "red rock cider advert, 1990's". Retrieved November 29, 2010. ^ "Classic Ads: Red Rock Cider: Fraud Squad Albert Einstein's Form Guide". Retrieved April 13, 2013. ^ Baer, Randy; R.D. Reynolds (2003). Wrestlecrap: The Very Worst of Pro Wrestling. ECW Press. p. 168. ISBN 1-55022-584-7. Wikiquote has quotations related to: Police Squad!